With the news that Xavien Howard will be a game-time decision to play this week, the Miami Dolphins are possibly going to be missing their best defender on the defensive side of the ball. Howard, the AFC Defensive Player of the Week has seven interceptions and is Miami’s lock-down corner. If he is able to play (and we feel he will), he’ll probably be locked up with Josh Gordon on the perimeter. Adam Gase didn’t sound confident that he’ll be able to go this week for the Dolphins who at 6-6 are still very much in the Wildcard hunt. Torry McTyer would likely get the start if indeed Howard can’t go. McTyer, 6’0, 187 a 2nd-year UDFA from UNLV has started in two games this season (Chicago, Cincinnati) and has a confidence level matching Howard’s. However, the rest of Miami’s secondary has struggled in 2018. When opposing quarterbacks have targeted any Dolphins defender not named Howard this year, they have completed 68.5 percent of their passes, averaging 8.1 yards per attempt, throwing 19 touchdowns, 12 interceptions for a passer rating of 96.9. Miami has given up the 3rd most explosive plays this year (that is considered to be a 15-yard run or more and a 20-yard pass play or more). The Dolphins have allowed 12 touchdown passes of 20 yards or more thus far in 2018. But the issues with Miami’s defense rests within their run defense. 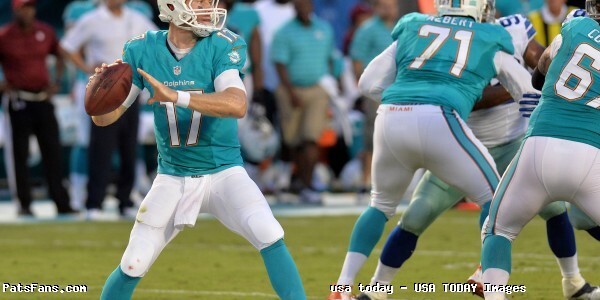 Remember the Dolphins started the season 3-0 and came into New England riding high. They were blown out in that game 38-7 and have gone 3-6 since because of issues stopping the run. Miami is currently 30th in the league in run defense, allowing 5.0 yards per carry and a whopping 144.7 yards per game on the ground. The New England game where they allowed the Patriots to run for 175 yards started a bad trend where they gave up 164 on the ground to the Bears, 248 against the Lions, 188 against the Houston Texans, 195 against the Packers and 198 last week against the Bills, although most of those were Josh Allen scrambles, which gashed them badly. Miami’s 4-3 defense hasn’t gotten great tackle play inside, their consistency has been poor and their linebackers notably MLB Raekwon McMillan and Kiko Alonso haven’t been good against the run either. The Miami run defense was leaky in 2017 as well and they had hoped to fix it going into the 2018 season. But their first couple of preseason games showed that perhaps that wasn’t the case as they were gashed but then things solidified somewhat. That 3-0 start masked what was still an issue and they’ve been battling this since then. Unlike in other years when traveling to Miami (2013, 2015 come to mind) when the Patriots went into the games with a walking MASH unit, the Patriots are about as healthy as they’ve been all season. They attacked a Minnesota defense that was a Top 5 unit against the run and garnered 160 yards on the ground. With Sony Michel back to full health and Rex Burkhead back from IR, look for New England to line up this week and try to pound the ball between the tackles. That should open up play-action passing for Tom Brady and the wide receivers. This is essentially a playoff game for the Dolphins who have to finish strong for any chance to make the postseason. They face the Patriots this week, travel to Minnesota to take on the Vikings, return home against Jacksonville and close out the regular season on the road in Buffalo. 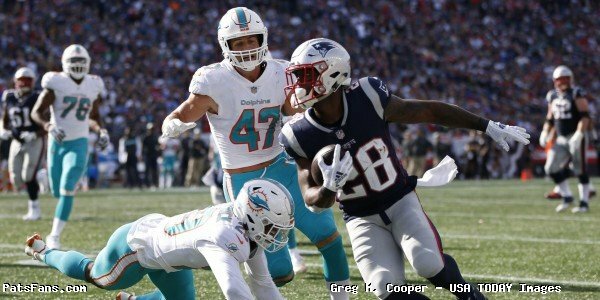 Last season, the Patriots were caught looking ahead to the Pittsburgh game and were thrashed in every phase of the game losing 27-20 to Miami in a game that wasn’t even close to what the score indicated. That will be a big, big teaching point by Bill Belichick this week. Lo and behold, the Steelers are again on the slate next week. Don’t expect the Patriots to make that same blunder twice. Last year, the Pats could afford to lose the game and still secure home-field advantage for the playoffs with a win over Pittsburgh. The 2018 version of the Pats does not have that luxury. Miami is on the cusp of a playoff berth themselves. There won’t be no overlooking them this time. Expect a much better game this week. And look for the Patriots to pound the ball in the running game. We’ll have much more in our keys to the game tomorrow. 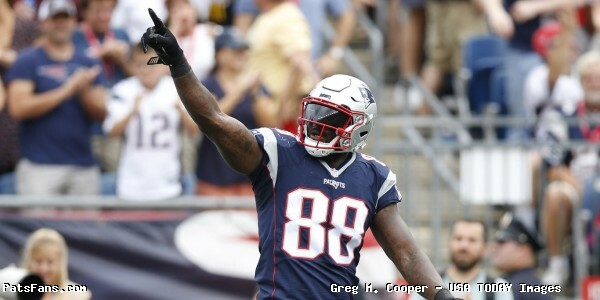 This entry was posted in 2018 Patriots Regular Season, Grogan's Grade, NFL News, Patriots Commentary, Patriots Film Room, Patriots News and tagged 2018 Patriots season, Bill Belichick, James White, Kiko Alonso, Miami Dolphins, New England Patriots, NFL, Patriots, Patriots running game, Raekwon McMillan, Rex Burkhead, Sony Michel, Tom Brady on December 6, 2018 by Steve Balestrieri. Reviewing the game film from the Patriots win over the Dolphins there were several areas to focus on but because of the short week and the Texans arriving here on Thursday for the game, we can’t wait for the All-22 coaches film to be made available later on Tuesday. And we’re going to focus just on the Patriots offense this week. The defense and the issues they had in the second half is an area that should be discussed and we’ll cover some of the problems that need fixing when we do our Houston breakdown of key matchups. Prior to his injury, the Patriots offense under Jimmy Garoppolo was clicking on all cylinders. He was making all smart decisions with the football and knew where to go with the ball especially when Miami brought pressure. We’ve highlighted a few of the key plays for the offense, and while the offense will no doubt be a limited one with rookie Jacoby Brissett under center, once either Tom Brady or Jimmy G. returns, the unit will be a tough one to stop given the available weapons at their disposal. Amendola 12-Yard Touchdown: After the Patriots moved down the field with ease, they were in great shape at the 12-yard after Martellus Bennett took a screen pass down the right sideline. At the snap, the receivers on the outside took the secondary into the end zone. The linebackers drop into the middle of the field at the hash marks. Miami rushed four and got good pressure on the edges but not up the middle. Garoppolo was able to sense the pressure, step up in the pocket and kept his eyes focused downfield. Amendola lined up in the right slot and initially sat down in the space between the linebackers. But with both moving as the Garoppolo stepped up, Jelani Jenkins stepped to his left, right into the throwing lane. Amendola didn’t panic, just took two more steps to his left and was wide open as Jimmy G. delivered the ball. The players in the secondary couldn’t react in time as he scampered into the end zone for an easy score. Bennett 20-Yard Touchdown: On the Patriots second drive of the afternoon they again moved well down the field. They were set up inside the red zone at the 20-yard line after Chris Hogan made a really nice catch to put them in position. The Patriots were facing a third and nine from the 20 and once again, Garoppolo was spot on with his reads and where he wanted to go with the ball. Miami rushed four and got a push on the edge but Garoppolo was able to step up in the pocket to make the throw. Miami was looking for Amendola on a crossing route at the sticks in the middle of the field. The free safety Abul-Quddus broke hard up into the passing lane. Bennett was lined up on the right and beat the jam of Kiko Alonso at the line. Alonso tried to sneak a peek back into the backfield and Bennett recognizing that the safety left a hole in the seam, held up his hand as a signal that he was open. Garoppolo delivered a dime right on the money to Bennett as he crossed into the end zone for another easy score. Amendola 10-Yard Touchdown: The Patriots third scoring drive of the day found them on the Dolphins 10-yard line and facing a third down and four yards to go for a first down. This time, the Dolphins bring pressure from everyone up the middle and from the left, Garoppolo’s blind (left), side. The wide receivers on the outside run straight up the seams clearing out the perimeter. Bennett runs an out pattern to the left taking the defender with him to the sideline. Amendola is lined up in the right slot. Abdul-Quddus is in coverage and is shading him to the outside. The blitz vacated the middle of the field completely and Amendola, recognizing this runs a skinny post into the wide open middle. Abdul-Quddus is in chase mode immediately and can’t do anything to stop the pass. Garoppolo is under heavy pressure but was able to deliver it to Amendola who was hit perfectly in stride for the third score of the day for New England. Coincidentally, it was the first time in his career that Danny Amendola has had multiple TDs in a game. Blount Hurdling Maxwell for a 26-Yard Gain: LeGarrette Blount had a fantastic game. He carried the ball 29 times for 123 yards and a touchdown and nearly single-handedly killed off five of the final six minutes when Miami KNEW the Patriots were going to run. 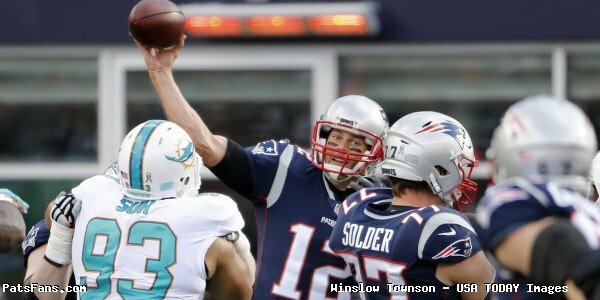 One of his absolute wow type plays of the game occurred in the fourth quarter after Miami had narrowed the Patriots lead to 31-17 and New England took over on their 18-yard line with a first and ten. On what became kind of a signature play in the final quarter, the Patriots ran to the left behind LT Nate Solder and LG Joe Thuney who pulled and led the way for the big man to run a sweep. DE Andre Branch was coming hard down the line inside and was sealed by center David Andrews. Chris Hogan stopped Jenkins from flowing over from the OLB position. CB Byron Maxwell flew up and attempted to hit Blount low in an attempt to upend him at the first down marker. It was the correct move. Blount has 45 pounds on Maxwell and had a head of steam going. Any attempt to go high on him would have been an exercise in futility. He just couldn’t have guessed what was to come next by Blount. In an incredibly athletic move, Blount, all 6’0, 250-pounds of him, hurdled Maxwell like someone 50 pounds lighter. He rumbled all the way down to the Patriots 44-yard line for a 26-yard gain. The play was well designed and executed and would have been a first down. But the extra little show by Blount makes it one of the wilder, and wackier moments of the day. 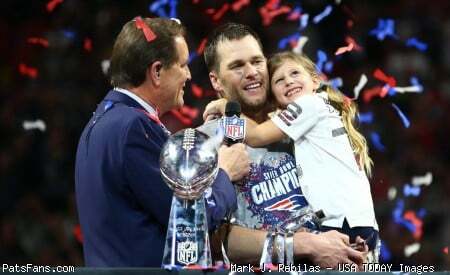 This entry was posted in Patriots Commentary, Patriots Film Room and tagged 2016 NFL Season, 2016 Patriots season, Bill Belichick, Byron Maxwell, Danny Amendola, isa abdul-quddus, Jacoby Brissett, Jelani Jenkins, Jimmy Garoppolo, Julian Edelman, Kiko Alonso, LaGarrette Blount, LeGarrette Blount, Malcolm Butler, Martellus Bennett, Miami Dolphins, New England Patriots, NFL, Patriots, Tom Brady, Trey Flowers on September 19, 2016 by Steve Balestrieri.